October in Tennessee is one of my favorite months. It's a transition month, with leaves turning, daylight shortening, air cooling and plenty of movement in the bird world. All of these signs plus a timeless, internal clock, signal Ruby-throated hummingbirds that its time to migrate. With breeding season behind them, they fatten up in September, ready to make their long journey to Central America. By mid October, most have already gone. (I last saw one at my feeders on Oct 11th but I'm still watching for them.) I love to see them fluffed up, perched near the feeders. Travelers, taking a much needed rest. Their energetic presence is so missed during the winter. But I will be leaving feeders out throughout the winter for the chance hummer that stays. 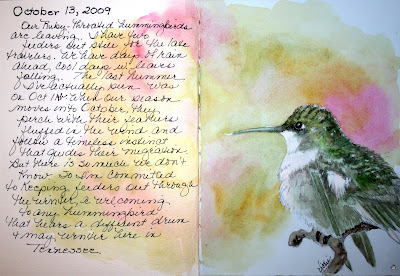 For more hummingbird stories and sketches, click here. Always beautiful art...Love the hummer..I hope it stays around for u! Beautiful, Vickie! Thanks for showing the close up of the hummer - outstanding! A beautiful piece of art Vickie. 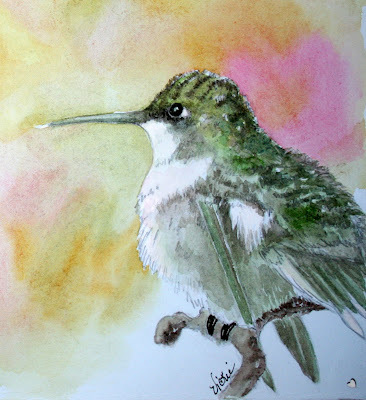 Thanks Vicki for the wonderful information and awesome painting, he looks so fussy and soft!